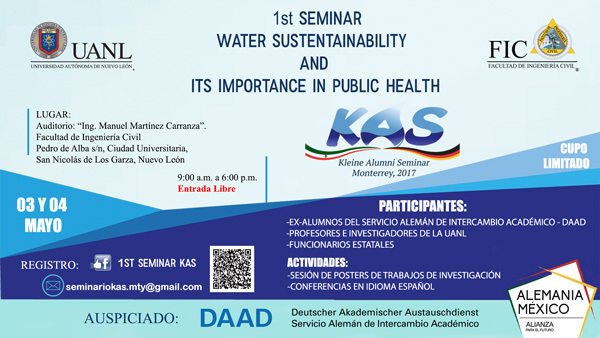 The first edition of the Kleines Alumni Seminars (KAS) on “Water sustainability and its importance in public health” is aimed at strengthening the important presence of the DAAD in Monterrey and aims to extend the activities of experts trained in Germany and special guests. The availability of quality water and its effects on human public health are priority areas for sustainable development at the global level, so it is necessary to strengthen multidisciplinary work teams that address this issue. The objective of this 2-day seminar is to connect experts from the scientific community working with water resources management and health. It is supported by the German Academic Exchange Service. Time: 9:00-18:00 Horas, Free entry, Limited availability. Publicado em x_Outros-Eventos_PT por Joerg. Marque Link Permanente.